Where's your bike? Chained up in town where you left it, or in the hands of some nefarious type in a lockup in the bad part of town? Once your bike gets nicked normally your only course of action is to ring the Police station for your crime number and then get onto your insurance company. But it'd be a lot easier if you could just take the rozzers round and get it back. Say hello to the Spylamp. Basically it's a standard-looking LED light containing a GPS chip and a pay-as-you-go SIM card. Most of the time it just sits there attached to your bike, you can even use it as a rear light should you so wish. If your pride and joy gets nicked, however, the GPS will do its magic and track the bike, drawing a nice line on a Google map for you to follow to the tea-leaf's house. To set the Spylamp up you just need a SIM card and your mobile phone: changing settings is simply a case of texting the unit a few simple commands, and it'll respond to let you know that it's been done. If you're leaving your bike then a long press on the on/off button activates a vibration sensor in the light: if anyone tampers with your bike then the Spylamp will text you to let you know, and then start tracking its location and uploading it to a free mapping service. Even if you forget to set the vibration sensor all hope is not lost: you can text the Spylamp to ask it to start tracking and it turns itself on periodically to check its status. You can even adjust the wake-up time via the settings. 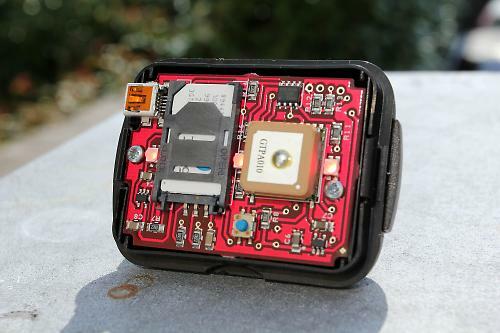 The battery is charged via USB and the manufacturers suggest that in normal use you can expect it to last up to a year between charges; you can text the unit to find out what the battery condition is like. We haven't set up our sting operation yet (look out for that) but we have had a chance to fiddle with the Spylamp and we're mostly impressed. Okay, if a thief knows that it's a tracker then it wouldn't be hard to remove – even with the steel lanyard that keeps it in place – but it looks just like a normal light so it won't arouse any suspicion in a casual thief. GPS chips need a line of sight to the sky to operate, so hiding the unit inside the frame or components of a bike isn't really a goer, and replacing a component (such as a saddle or handlebars) won't appeal to owners of higher-value bikes. The rear light is a decent compromise. So far we've just checked that it works: we stuck it on the balcony outside the office and texted it to update its location. The map that was returned had a Google Streetview image of more or less the exact spot, the arrow was about six feet off. Impressive stuff. We'll give it a proper test where we dress up a stooge in a stripy top and mask and get them to nick a bike from town and take it to an undisclosed location... stay tuned for that one.